Children of the late 60’s, 70″s and 80″s might remember Crazy Foam from their childhood. Cray Foam was first launched in 1965 by American Aerosol Company. Those first colorful canisters featured the likes of American’s most popular superheroes and pop culture cartoon idols, such as Popeye, Spider-Man and The Hulk. 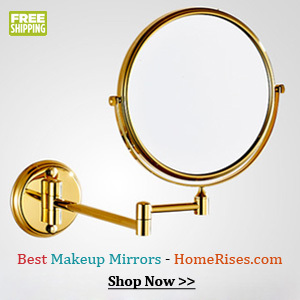 It quickly became a playful essential in American homes. It was known as the Fun Foam Soap. Kids even used to trade the caps (character heads) like baseball cards.Crazy Foam disappeared from stores, and bathtubs, sometime in the 1990s. 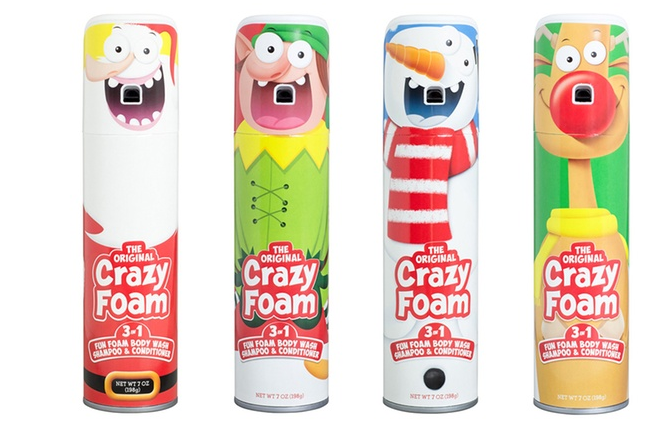 Crazy Foam is back for a new generation of children to enjoy, thanks to Boston entrepreneur Josh Fink. Kids will love this 3-in-1 body-wash, shampoo and conditioner that comes in cans adorned with retro pop culture superheroes, Looney Tune characters and whacky Christmas themes. Today’s reformulated 3-in-1 bodywash, shampoo and conditioner is dermatologist-tested, hypoallergenic and comes in a bigger can with a redesigned spray button making it even easier for small hands to use. I do recommend keeping the foam away from the eyes though. 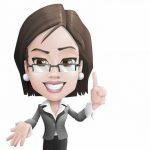 Combining a way to get clean with the novelty of playing with bath-time fun foaming soap makes bath time more creative and imaginative for kids. One small squirt forms a large ball of foam which can be molded and shaped. The soap is great for pretending to shave like dad, and ideal for encouraging hand washing. 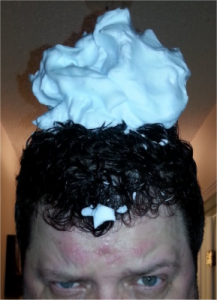 Even my husband got in on the fun, though he was not too impressed when I sprayed a huge foam ball on top of his head. My daughter on the other hand thought it was hilarious. 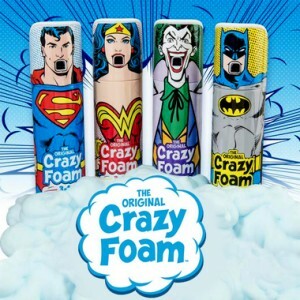 Get kids excited about bath time this holiday season with Crazy Foam! 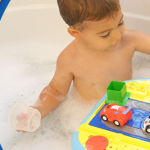 Combine Crazy Foam with Rubba Ducks and you have the ultimate bath time gift. These look super fun, I think I remember them in the stores years ago. Glad they are back!